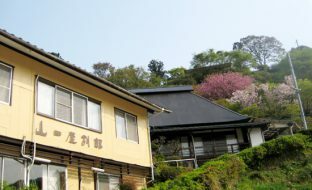 In Tawarayama, where the practice of outdoor bathing is common, this onsen features private indoor family baths ("kazoku-buro"). Guests to Yamaguchi-ya Bekkan are welcomed to enjoy the feeling of an older Japan in our separate villa, "Gou-gou Iori." 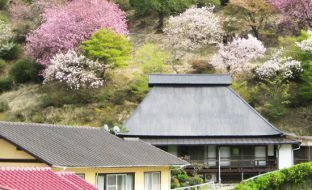 The villa is an elegant Edo Period (1603-1868) building in the Sukiya style of traditional tea houses, and was moved and reconstructed here, complete with a cozy sunken hearth. Pets are also welcome here. Dining includes seasonal banquets, and in the winter, full courses of blowfish and turtle. 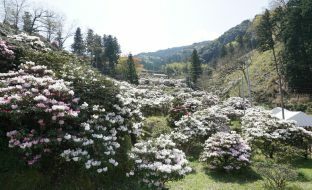 This garden boasts over 30,000 rhododendrons that bloom thick across 5 hectares of mountainside. 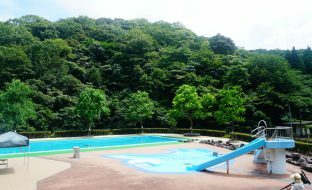 Encircled by forest, this tranquil pool is located in view of the Shichiju River, and not far from a waterfall with seven falls. 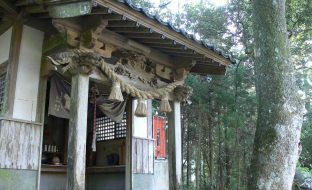 This shrine is dedicated to the bodhisattva Kannon, the goddess of mercy, and is often visited by pilgrims praying for fertility and health.